What is an Lvkv 90? 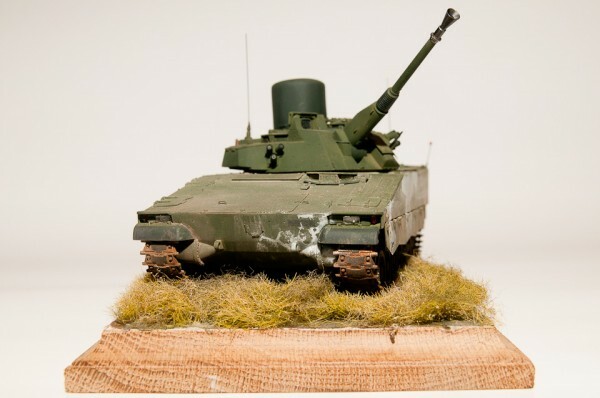 The Lvkv 90 is the anti-aircraft version of the CV90 family of vehicles developed by Hägglunds in the 1980s for the Swedish army. 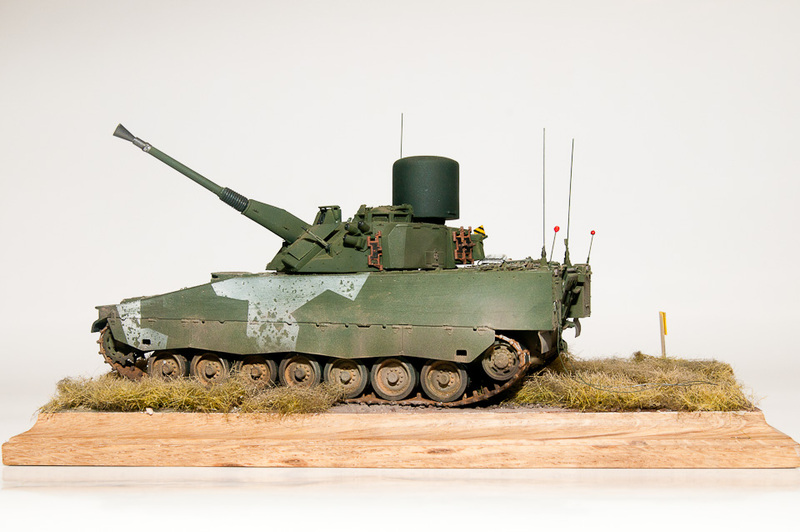 The Lvkv uses the same Bofors 40mm gun as the regular IFV version, the Stridsfordon 9040. The Bofors gun is in fact a version of the same Bofors gun used in world war 2, but is slightly modernised using larger shell casings and longer barrel. In the Lvkv the gun is modified to be able to shoot “3P” ammunition, the three P´s means “Programmable Pre-fragmented Proximity fused” which means that the round can be programmed to either explode on impact, by proximity fuse, to explode after a pre set distance or a pre set distance after the proximity fuse detects a target. 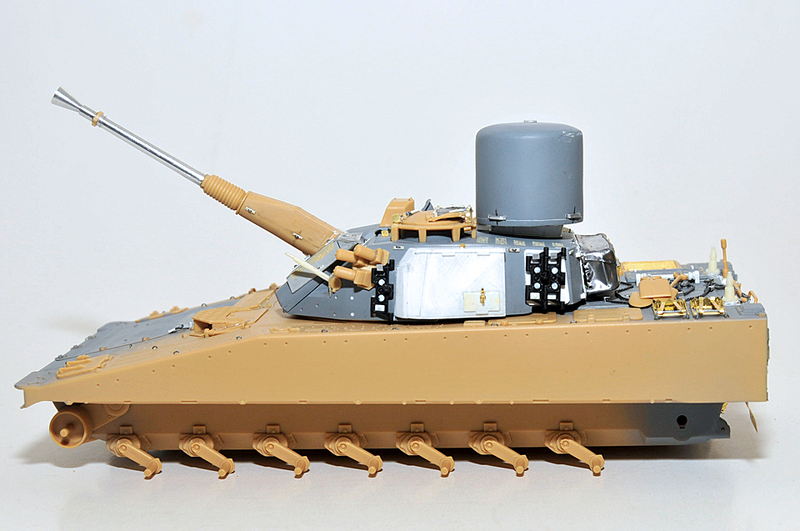 The Lvkv 90 has also been equipped by a radar to find targets and to guide the gun to them. It is housed in a large “trash can” on the turret roof, this making the identification of the Lvkv easy. 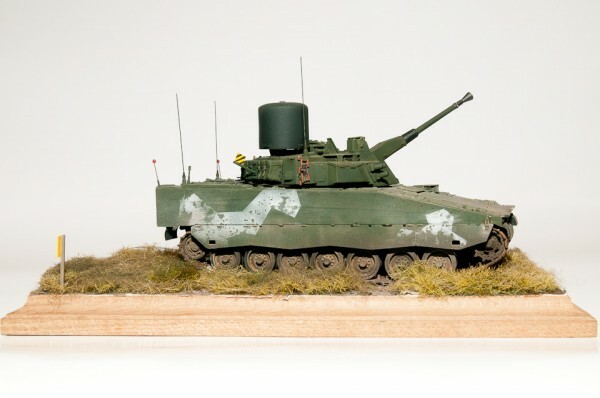 I choose to build on the nice Academy kit of the Combat Vehicle 9040B in 1/35. 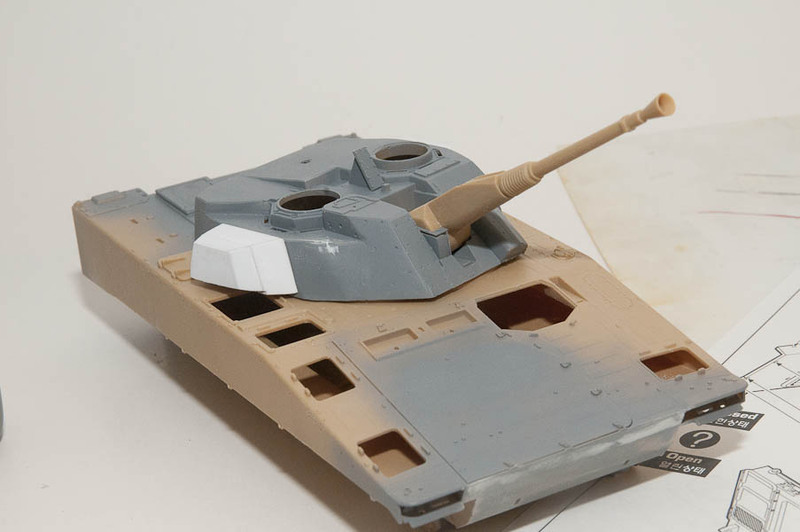 When this is written, it is the only 9040B available in this scale, but HobbyBoss, who has released a C version will soon release the B as well. 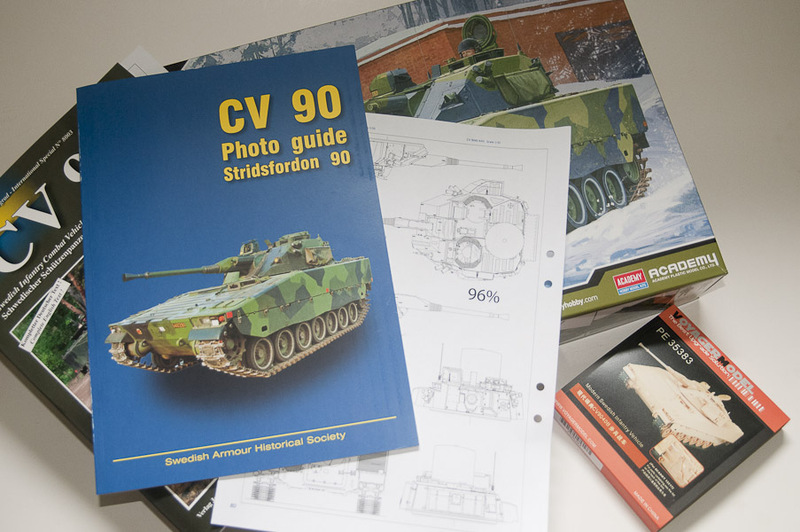 For references I use the Tankograd booklet about the Combat Vehicle 90 in Swedish service, and the SPHF book “CV 90 Photo Guide”, that according to my opinion, is the best CV90 reference book to date. The SPHF book has 1/35 scale drawings by Kjell Svensson of some of the major versions of the CV 90 at the end, including the Lvkv 90. Without them, this project would have been nearly impossible. After careful study of the Academy kit versus the drawings I came to the conclution that the Academy kit is slightly under-scale compared to the drawings. I copied the drawings at 98% scale, and that seemed to fit the chassis perfectly. 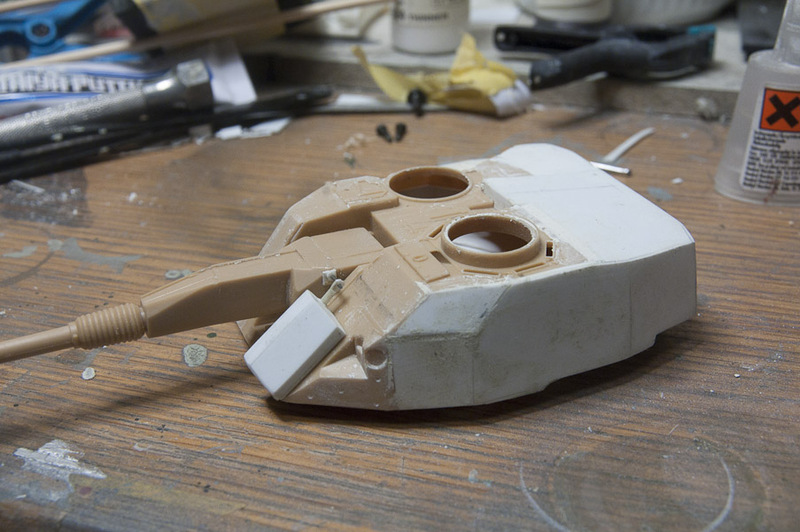 The turret however, is slightly more under scale, and at 96% I got a match. 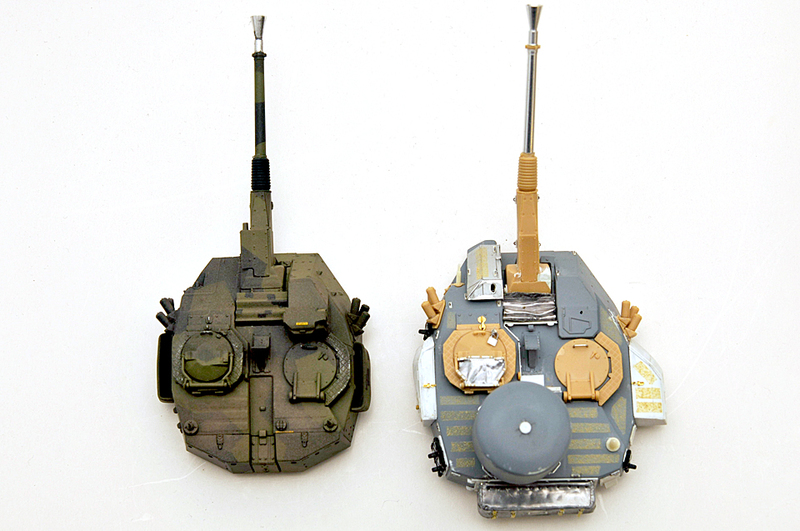 As a comparison, the Hobbyboss CV90 chassi is very close to the academy chassi, but the turret is slightly larger. So what I can say for certain is that the Academy turret is slightly under scale, and that the Hobbyboss kit of the 9040B could be a better foundation in this respect. I also used some after market items, like photo etched details from Voyager and MK designs, a Ksp m/39 barrel from Kjell Svensson and a pair of antenna mounts from Pro Art that I had laying around. A comparison between the standard 9040B turret as it comes out of the Academy box, compared to the modified Lvkv 90 turret. 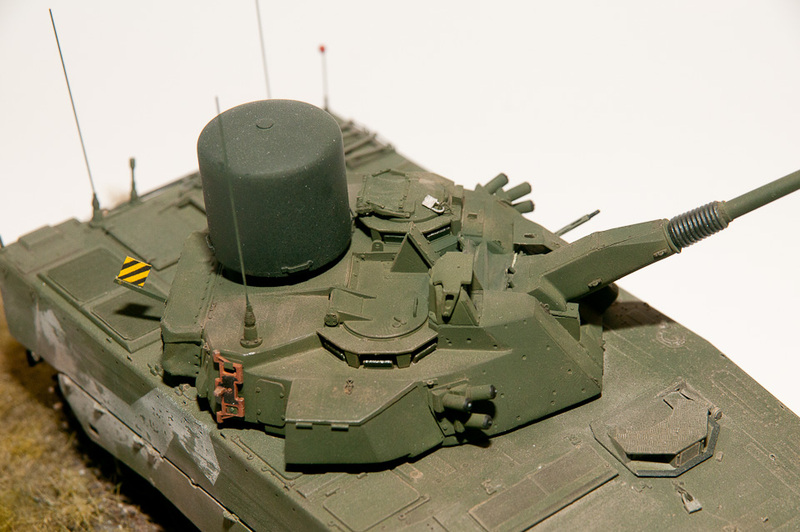 The barrel on the lvkv turret was not glued in place when the picture was taken, so the bend was not permanent. The UTAAS-sight is also missing from the Lvkv turret. 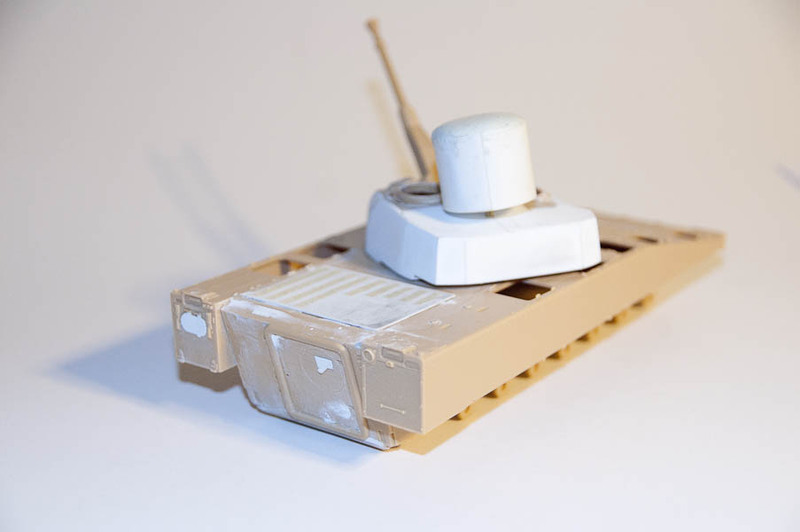 The Lvkv turret looks at a glance like an ordinary CV90 turret that has been extended backwards to house the radar equippment. Unfortunately things are not that simple. 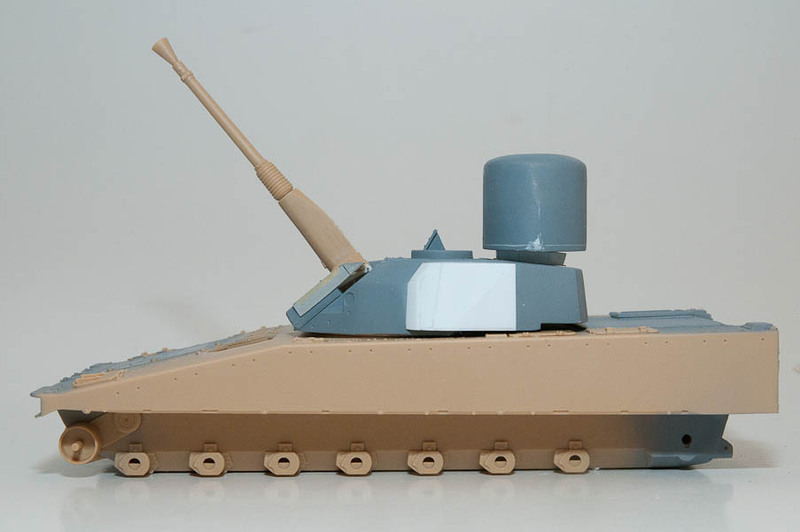 The turret is longer, wider and shaped slightly different. As if this was not enough, the Lvkv 90 is based on the Strf 9040A, while the Academy kit is a 9040B. The obvious differences are the external dampening cylinder and the lack of the back up sight camera on the side of the gun barrel on the A. 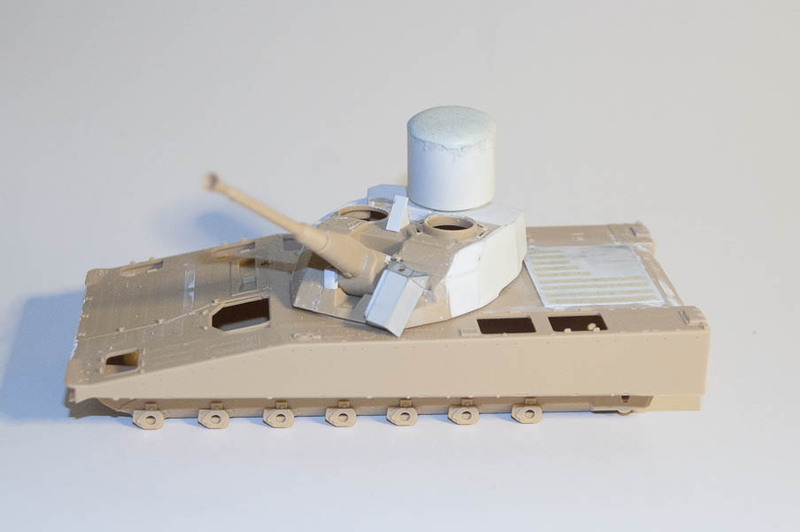 When I was building the dampening cylinder I noted that I could not get the geometrics right, which led me to the conclusion that the pivot point of the gun elevation is too far forward on the Academy kit. 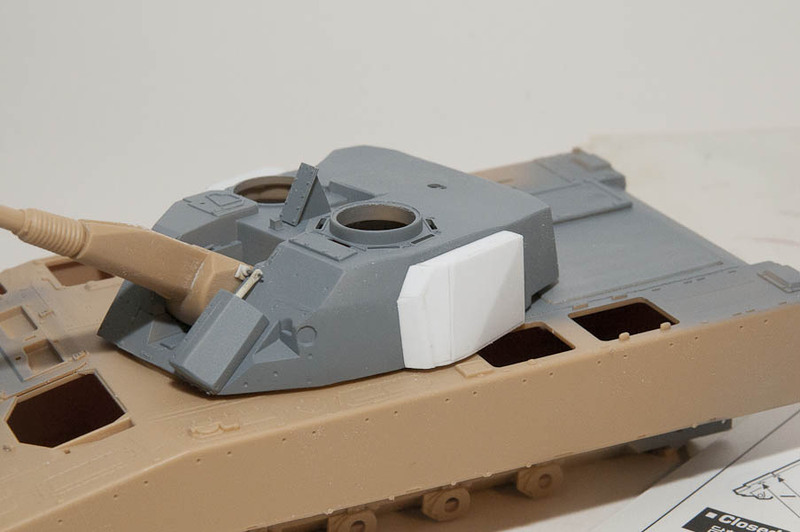 I had to move the pivot point a few millimetres rearwards in order to have the dampening cylinder mount on the gun barrel clearing the turret armour. 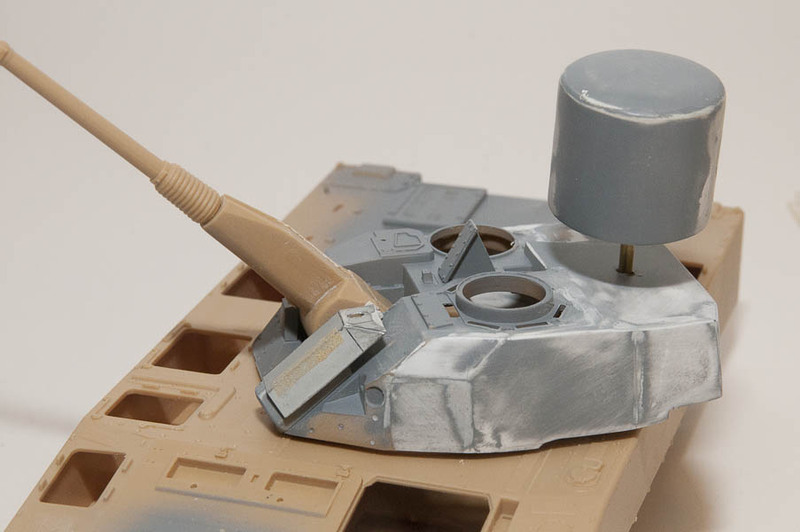 The old pivot point can be seen as a small white dot on the gun mantlet just next to the dampening piston. 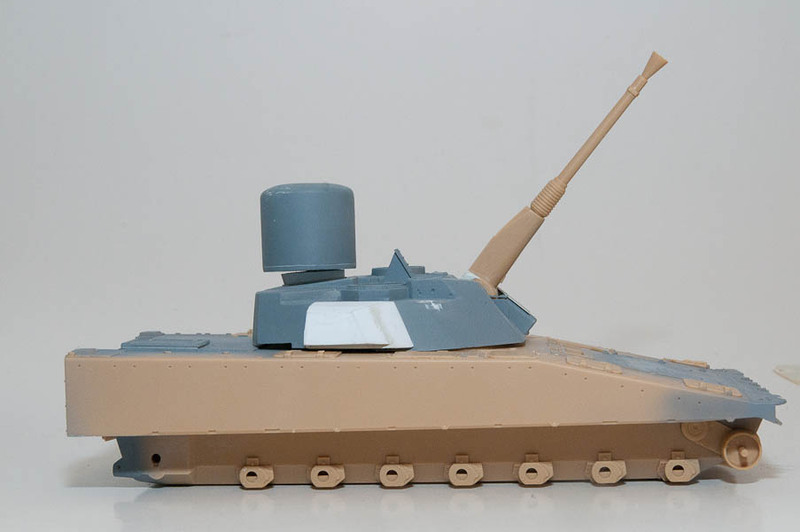 When the basic shape of the turret was done, the two stowage boxes on the turret was built. These were detailed with latches from the Voyager set. 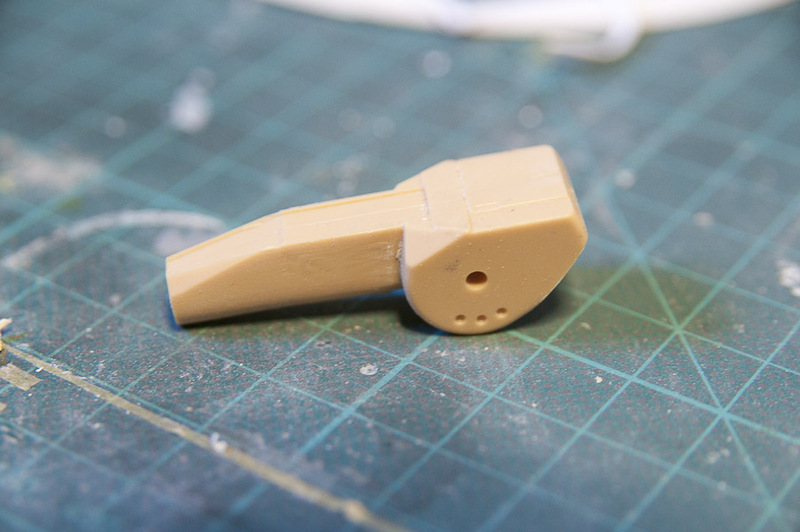 Etched parts were also used for various small details, like the back up sights. Most details were however scratch built. For instance the photo etched tread plates over the periscopes did not quite fit, so I decided that the plastic ones looked good enough, and required no additional work compared to the work needed to make the photo etched parts look good. To the rear of the turret, a tarpaulin covered stowage basket was made by first creating a skeleton out of steel wire. The tarp was then recreated using self adhesive lead tape I have found in a sports fishing store. Masking tape was then used for the straps, with the buckles made out of thin aluminium. The spare tracks come from the single link tracks that Academy includes. They were mounted on hooks made by thin aluminium plate. 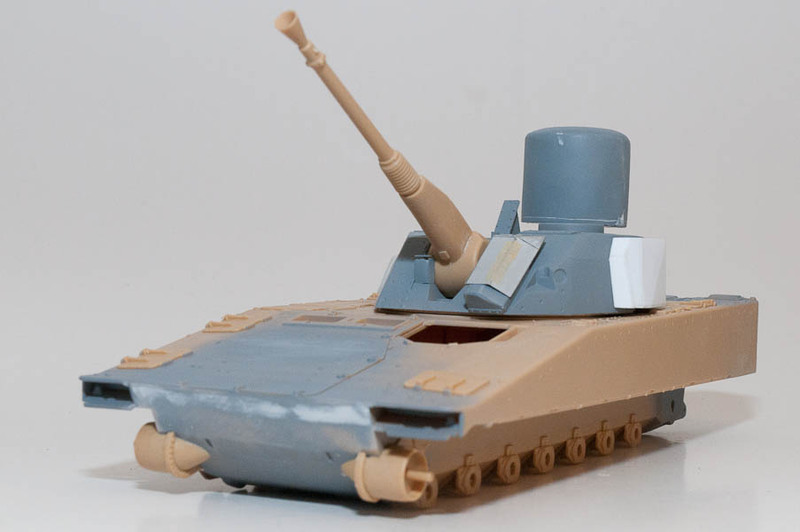 A resin antenna mount and a resin machine gun barrel finished the turret. 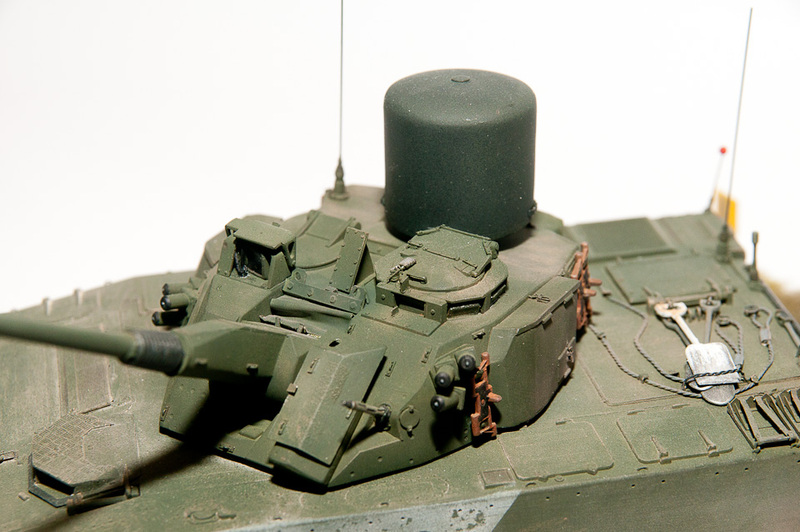 When I started this project, I thought that the radar would be one of the hardest parts of this build. I do not own a lathe, so I could not just simply turn this shape out of a suitable rod of acrylic or something similar. I had to build it out of plasticard. To build a simple cylinder, that doesn’t sound very hard, does it? But to do a completely straight and symmetrical cylinder without any visible seams was not so easy for me. 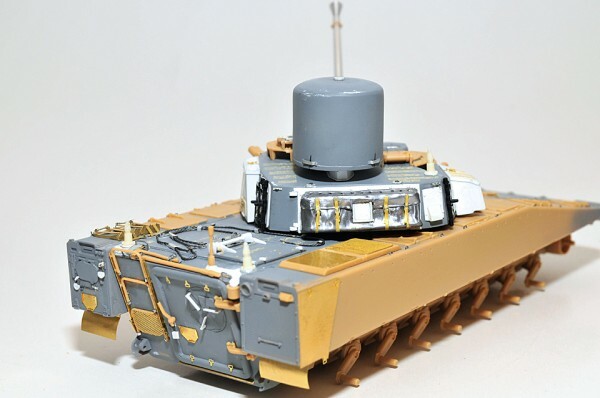 But in hind sight, the radar wasn’t the most difficult part of the project, but that has more to do with the fact that the rest was harder than anticipated. Anyway, it took three tries before I was happy with the simple cylinder. 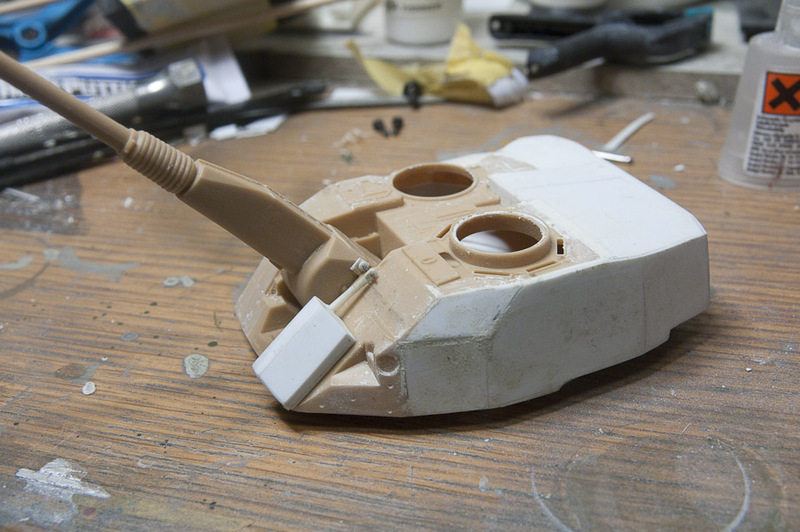 I made the rounded top with Tamiya two component filler. Inside the radar shroud I placed a brass tube, and on the radar mount on the turret, there is a corresponding brass pin, enabling me to easily remove and attach the radar to be able to paint and weather the parts separately. 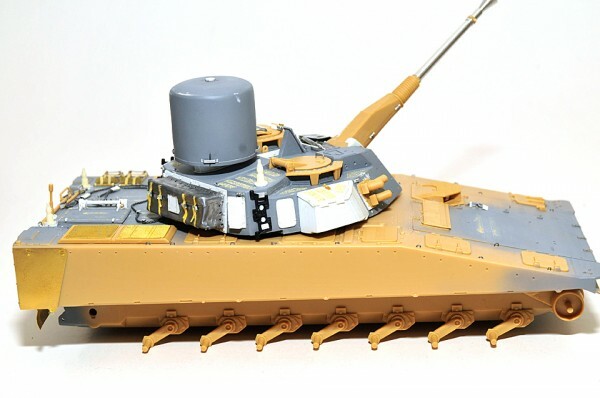 It was important to get the tube and pin installed at perfectly right angles, otherwise the radar will not sit right on the turret. Unfortunately I was a degree off somewhere and the the radar tilts slightly – unless… it is rotated so that the errors in the pin and tube take out each other and the radar sits perfectly on its mount! Four handles out of aluminium finishes the radar. 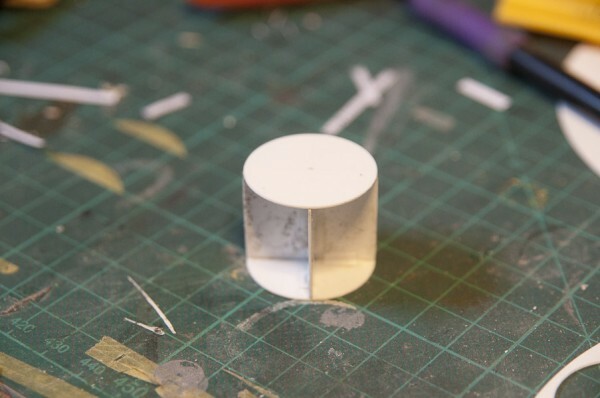 “A simple styrene cylinder” is taking shape. 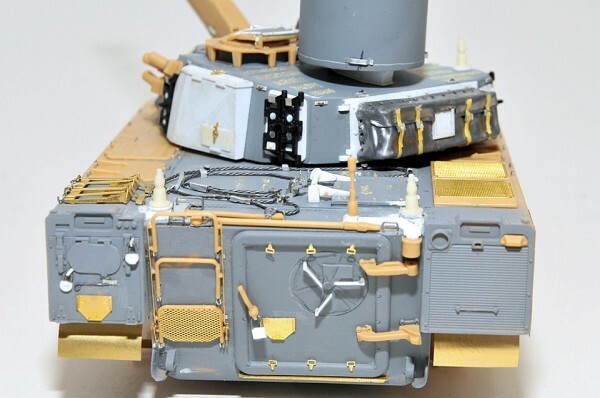 The LVKV is missing the two large hatches above the troop compartment, that the regular CV 90 has. Instead the area is covered by a flat piece of steel plate, welded in place. A recent modification is the addition of a spring loaded emergency hatch. 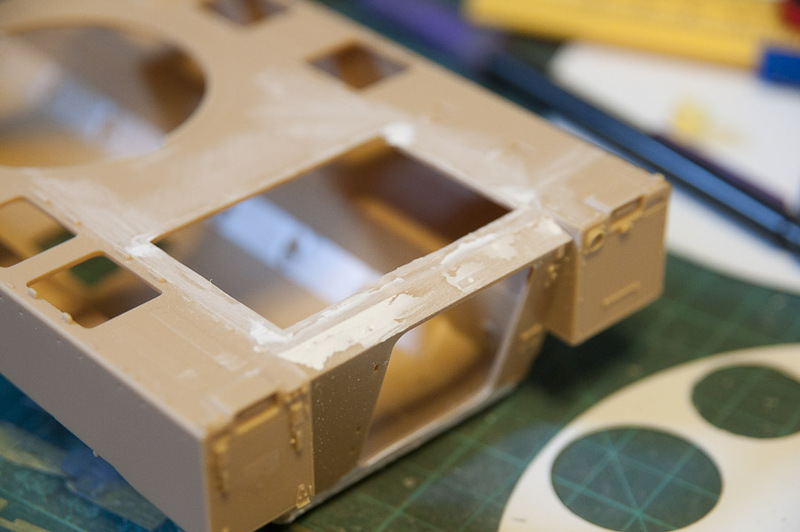 The hatch was build out of plasticard with bolt heads made of slices of stretched sprue. 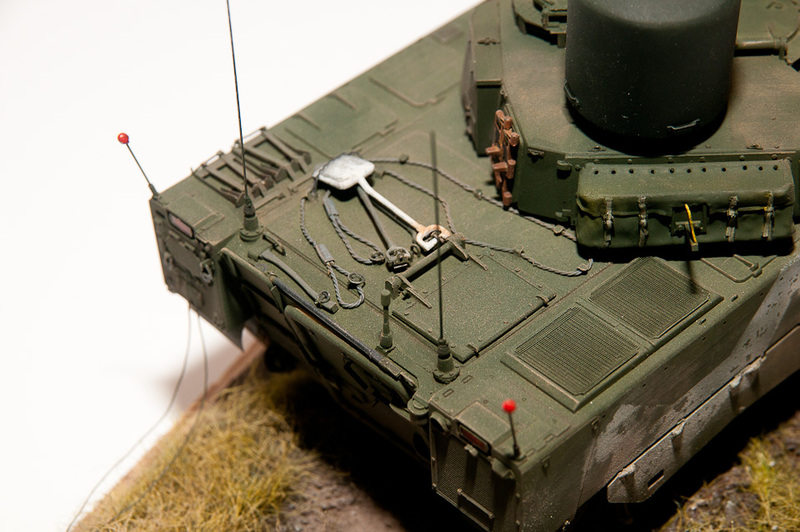 The roof also received a scratch built tow cable out of lead wire and aluminium. I also made all the tool attachments from thin aluminium plate, with small sprints out of wire. 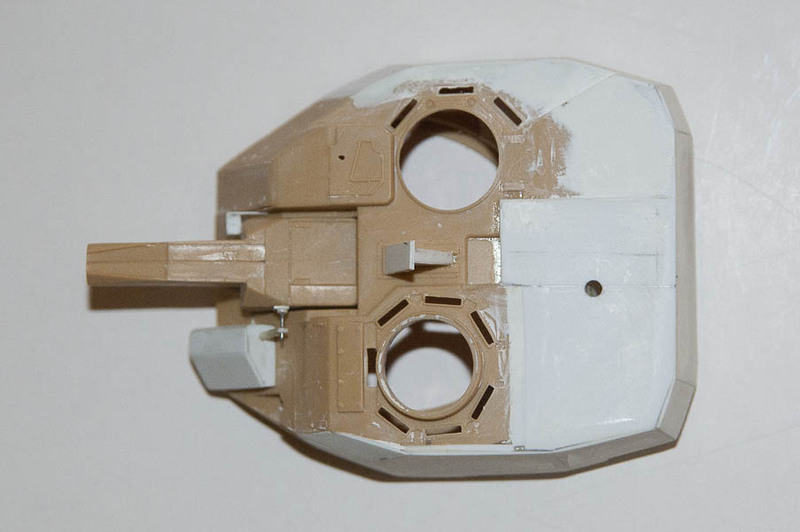 I replaces all the moulded in tie downs on the upper hull with thin lead wire pushed in to tiny holes that I spent all of my 0.3mm and 0.4 mm drill bits doing. In some of these tie downs, the track anchors from MK Designs were secured. The rear part of the kit offers plenty of scope for super detailling. More work than this builder had anticipated. 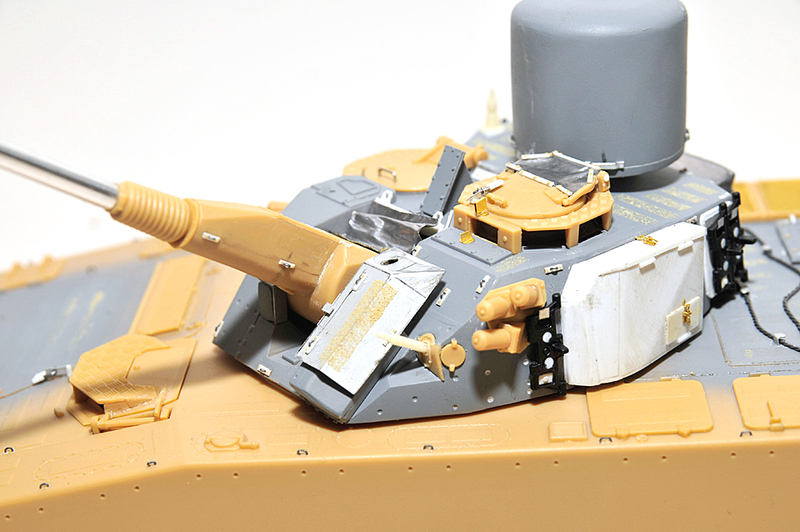 There are more differences between the Lvkv and the CV90 to the rear. The large hatch to the battery compartment has a smaller hatch, that was build out of plasticard, equipped with a scratch built padlock. The large door to the troop compartment has a circular escape hatch, and an opening for a periscope, that can be covered by a protective cover. The kit door had all its moulded in attachments for shovels and other stuff sanded off, then the circular hatch was scribed in. The protective cover for the periscope was made out of plasticard. 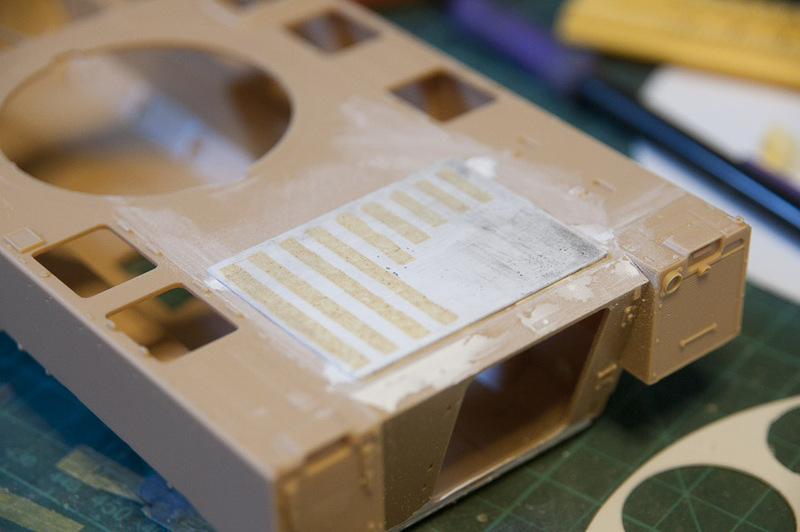 Plasticard and styrene rod was used for the latches that keep the emergency hatch in place. The compass (the short, stubby “antenna”) that is usually mounted to the right of the door is on the Lvkv moved to a spot on the roof just above the door. A new mount and the plate covering the cabling to the compass was made aout of plasticard. Two new mounts for antenna mounts were also created, and the antenna mounts themselves where added. 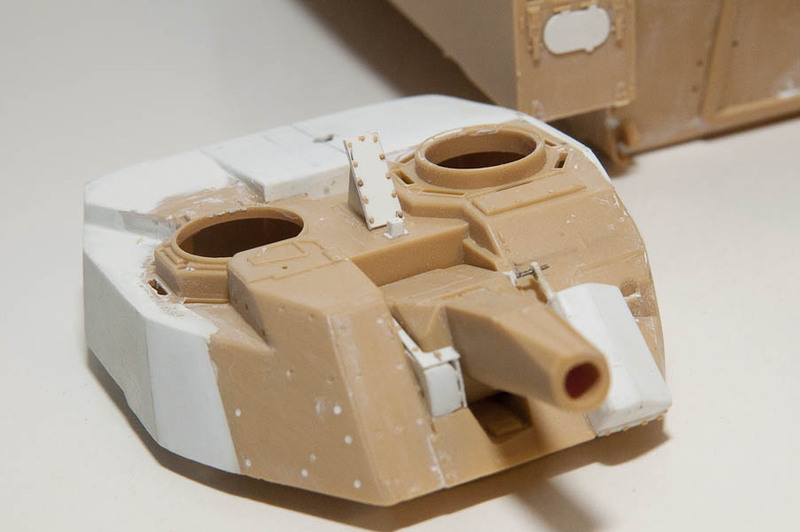 All the tool attachments had to be scratch built, since nothing was similar to the mounts used on the CV90. A lot of work was spent on the rear part of the chassis, more than I had anticipated. 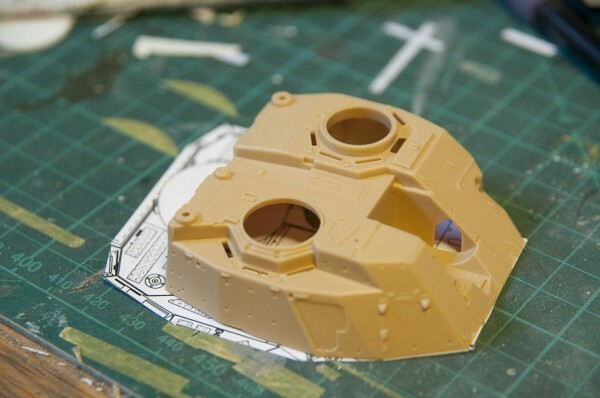 Much of this work could be done to spice up the ordinary kit too, if one would want to. I had from the beginning decided that I would do a single colour green vehicle, not the famous Swedish splinter camouflage. This decision had to do with the aesthetics, not at all with the prospect of the tiresome job of masking the camouflage. Not at all.. I also decided I wanted a fairly clean vehicle. I usually make them dirty – but I wanted this clean for a change. To be honest, I had actually no idea on how I wanted the model to look like when I was done. I usually have a photograph or an inner picture that guides me, but this build was more technical in nature. 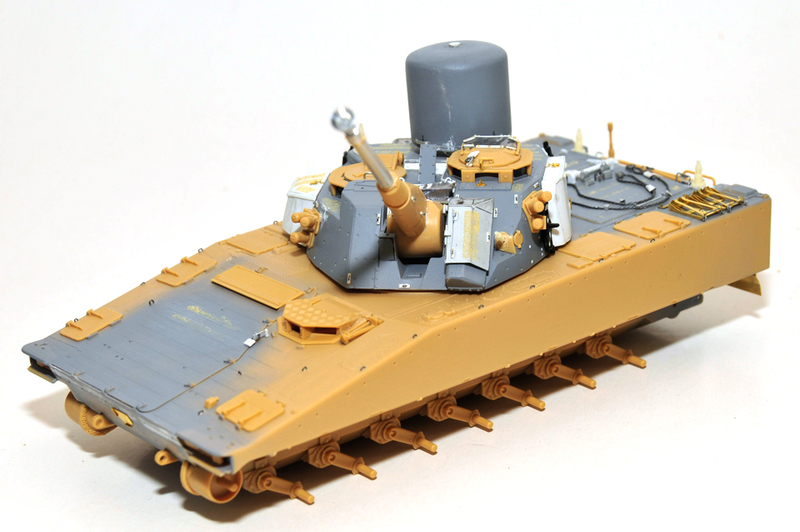 As a result of this, painting and weathering did hint of a lack of inspiration, or to put it bluntly, it was boring. A contributing factor was that the deadline for this build, the 2011 C4-Open competition in Malmö was closing in. The night before the competition, I had got as far as the pre-paint pictures is showing. It looks quite complete, but a closer examination shows a lot of details missing, and as we know, the devil is in the details. It took 12 hours of constant work to finish it. I also had the ambition to print my own decals, but they did not turn out as nice as I had hoped from my printer, so I gave that idea up. 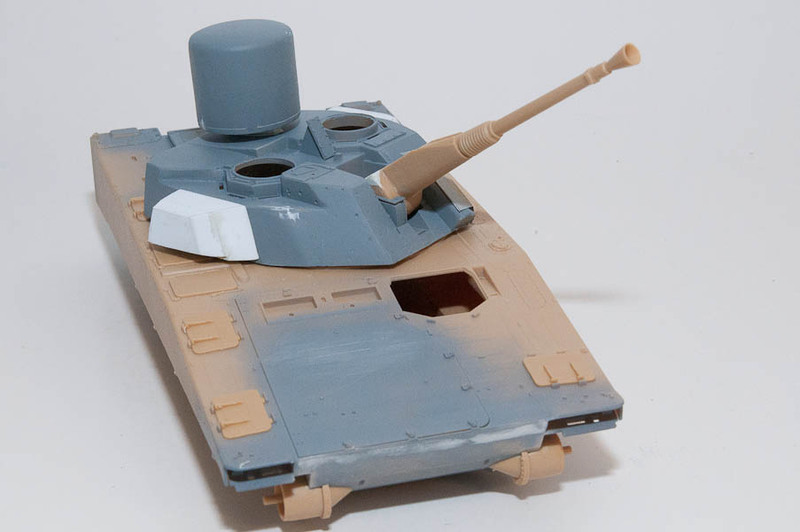 Anyway, the paints used are mainly Alclad grey primer and Tamiya Acrylics. 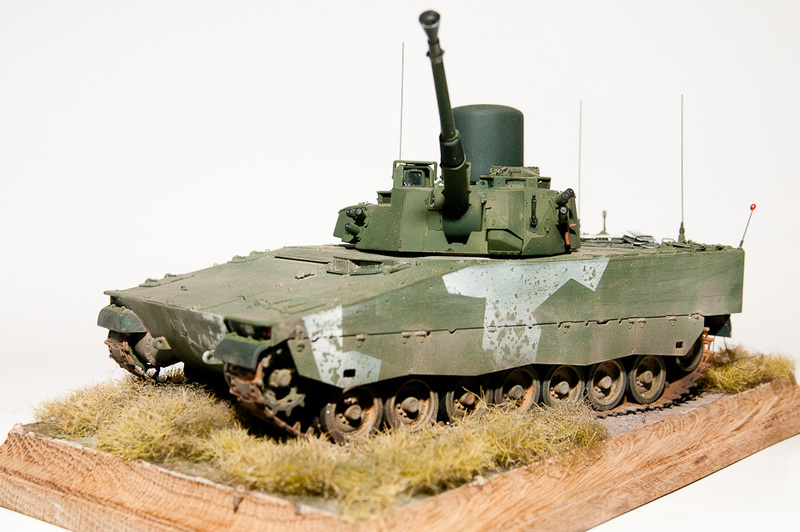 I used J.A Green with a few drops of NATO Black for the 326M dark green. 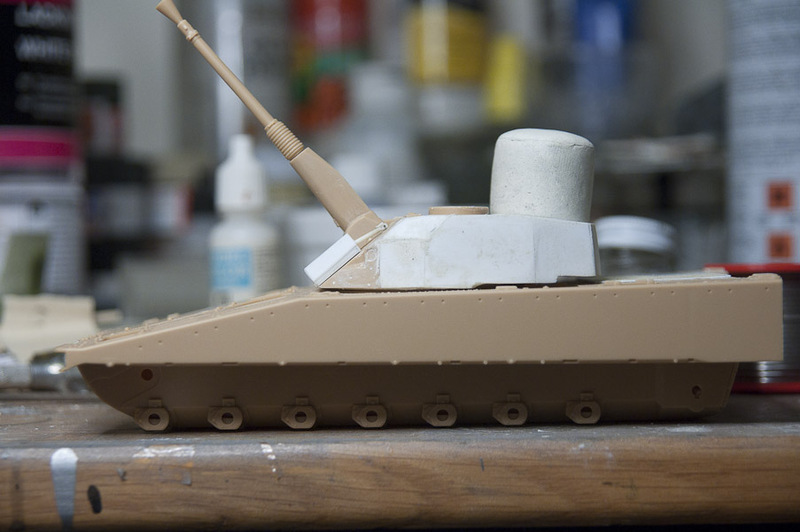 I used dry pastels and MIG-pigments for creating the dusty and dirty look all military vehicles have, even if they are clean. I made a base plate out of an oak base plate I bought at C4-Open (where the model won a bronze award by the way) by using regular wall filler as ground work, and added rail road grass as grass. It is not the best looking base plate in the universe, but it will do. 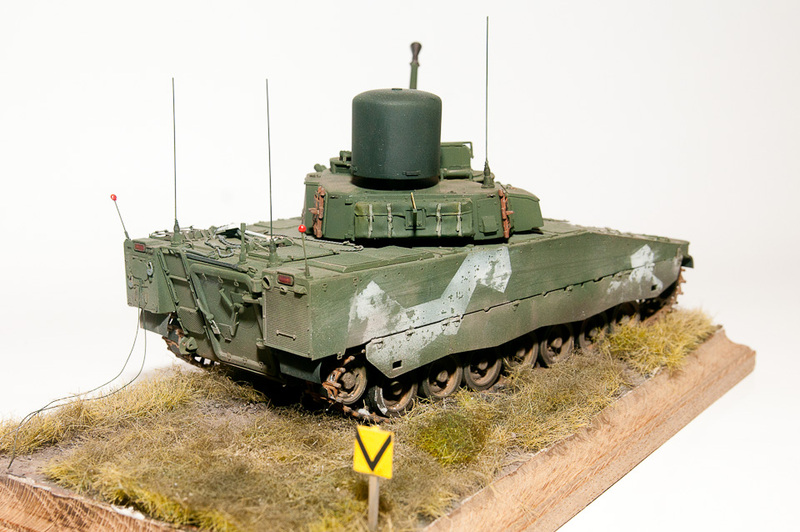 The vehicle is depicted as it is on a firing ground for target practise. When practising with live rounds, two signs are placed behind the vehicle, V and H (for “Vänster”, left, and “Höger”, right). The black and yellow “flag” to the rear of the turret should not point past any of these signs, since they indicate the limit of the firing range. I was, as already mentioned, not entirely happy with the paint work and weathering. Inspired by a photo of a green vehicle with faded rests of winter camouflage, I decided to have a go at the salt chipping method. I masked out some fields that was going to be painted white. Then I wetted the area slightly and added a few grains of salt. When the water had dried up, I painted the area with a thin, uneven layer of white. When the paint was dry, I used a stiff brush and wiped away the salt. In retrospect, I think I added too much white. It should have been even more translucent. But you live and you learn I guess. These were the five “Easy” steps on how to build an Lvkv 90 out of a Stridsfordon 9040B kit. If you decide to build your own, don’t hesitate to contact me if you have any questions! You can use the comment function below! 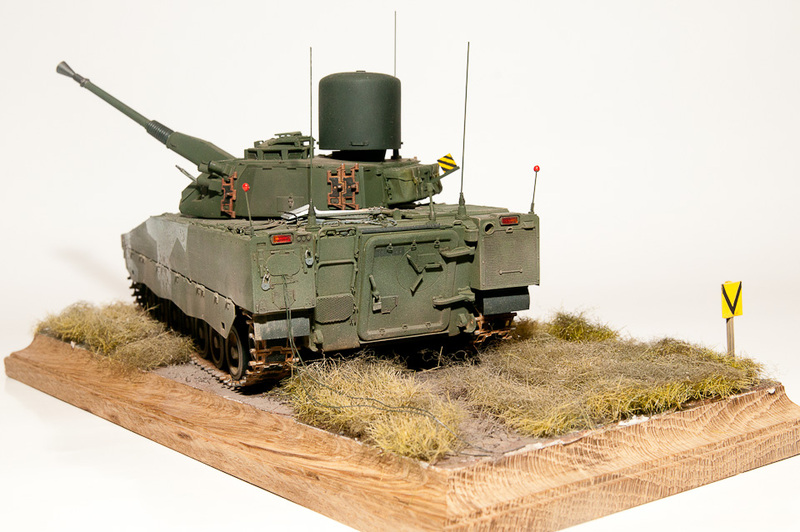 This entry was posted in Build blog, Finished work, Gallery, Swedish Plastic and tagged 1/35, Armor, Armour, CV90, Erik Gustavsson, Lvkv 90, Scratch built. Bookmark the permalink.